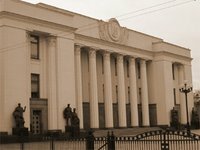 The Verkhovna Rada, Ukraine's parliament, has adopted as a basis and as a whole a law on the National Guard of Ukraine submitted by Verkhovna Rada Chairman Oleksandr Turchynov (No. 4393), an Interfax-Ukraine reporter has said. A total of 262 MPs out of the 330 registered in the session hall voted for a respective law on Thursday.